The taste of metal, the tingly sensation after the first vibrations on the mouthpiece. The slight soreness above the upper lip, and the tightening of muscles in the corners of my mouth. 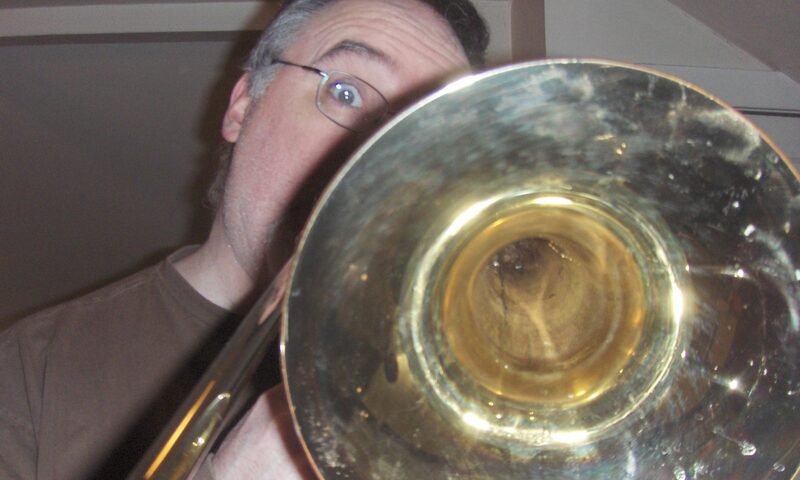 Deep breaths through the nose, pushed right back out through the embouchure with a buzz that would be considered unacceptably rude were it not for the 9 feet of twisted brass through which it is directed. The mind starts to recall what the muscles still seem to know. C# sounds in tune, not because I remember where to put my hand, but because my hand already knows where it needs to be. I can still fake my way through the first sight-reading, marking spots in my head that I’ll need to woodshed later. Second rehearsal much smoother, even starting to drop in little bits of personality that make the flute player giggle. Playing them with confidence helps me get away with the parts I’m still faking. 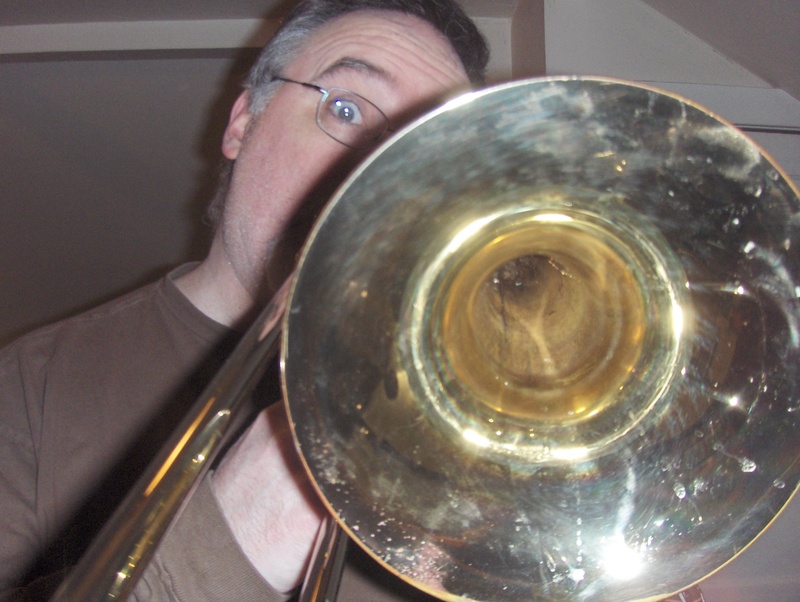 Things have gotten better and better with each rehearsal until now, five days from showtime, the reality seems to be sinking in – I’m a trombonist again. The whole experience of preparing for the Magenta Theater concert this Saturday has me remembering what it is like to juggle so many performing ensembles. In college, it was band, jazz band, choir, then later orchestra, but at least it was only trombone and voice, maybe occasionally drums in my fraternity band. Now, not only am I in four bands, but I’ve also got to be ready to play drums, percussion, voice, trombone, melodica, harmonica, pennywhistle and calimba. Sometimes I feel like I did when I was 12, in an arcade with a roll of quarters. I just can’t decide what to play next! Most importantly, the theory is coming back. Remembering how it all fits together. Having people ask me questions I don’t expect to be able to answer, but somehow helping them understand what I’m feeling when I play and sing. Reminding the guitarists when they have forgotten their capos. Maybe I’m reminded so much of college because I’m on a college student schedule lately, but 2010 is feeling like a year of inspiration and education and I hope to soak in as much as I can. I’m glad you’re impressed, but it’s a pretty common word among brass and woodwind players. There really isn’t a more colloquial word to describe the muscle and lip position in relation to the mouthpiece.